I think both approaches to terrain transitions have their benefits. 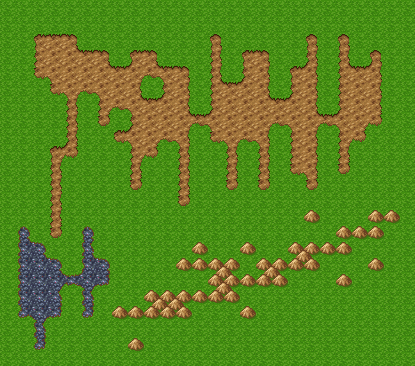 RPGMaker's version may appear to handle one-tile wide rivers, but since it works by first splitting up the tiles in even smaller pieces and then recombining them, it is not immediately clear how this could be implemented nicely in Tiled. In addition, that system is very specific to RPGMaker and outside of RPGMaker I've seen the majority of tilesets with such transitions using the system upon which the Terrain Brush is based. That said, there is an issue open about supporting the RPGMaker autotile format and maybe one day somebody will find a nice way to implement it. Also, regardless of the autotile format, Tiled should of course enable the easy placement of fences, roads and rivers. I think the Wang Brush could be improved to enable this. Well, to be honest, the rivers example was simply that: an example. I had hoped to save time by using that as an example, but no worries. I can't imagine it would be too terribly hard to change over to RPGMaker's style. Your system already kind of supports it. Instead of simply drawing terrain boundaries in colored highlights, you could have it set up to use symbols. I used my own tileset as an example, here. Left: symbols overlaying the tileset. Center: the symbols themselves. Right: the tiles themselves. The way I see it working is, the user would define the structure of the terrain, much like it already does, by marking with symbols which piece represents what part of the terrain as a whole. The editor would start with the tile marked with the 1x1 tile symbol, and then adjust itself and its adjacent tiles accordingly while the user draws in their terrain. It would require a little more work on the user's part to have a tileset that supports the system, or alternatively, it could work both ways: current style and RPGMaker style, with use of a tickbox option. If that seems a little too slow to have users set up based on symbols, no problem: simply have an auto complete feature. The user would only need to set down one corner symbol or a middle symbol in each chunk, and then click a button and Tiled would fill in the rest of them to the best of its ability.